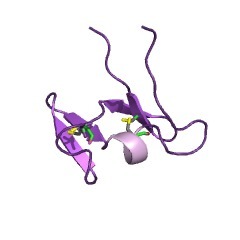 This domain is found in two distinct sets of proteins with different functions. Those found in aerobic bacteria bind cellulose (or other carbohydrates); but in anaerobic fungi they are protein binding domains, referred to as dockerin domains or docking domains. They are believed to be responsible for the assembly of a multiprotein cellulase/hemicellulase complex, similar to the cellulosome found in certain anaerobic bacteria. Plant cell wall hydrolases from aerobic microorganisms generally have a modular structure consisting of a catalytic domain linked to one or more carbohydrate-binding modules (CBMs). CBMs function to attach the enzyme to the polymeric substrate, thereby increasing the catalytic activity. Most CBMs bind cellulose and are referred to as cellulose-binding domains (CBDs), while some can also bind xylan. 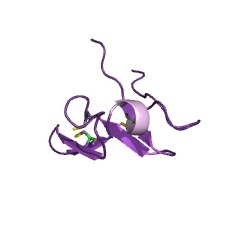 The structure of CBM10 from Pseudomonas Xylanase A has been solved [(PUBMED:10653641)]. The domain consists largely of beta-sheet with three aromatic residues (Tyr8, Trp 22, and Trp24) that are exposed and approximately coplanar and well placed to interact with cellulose. There are 456 CBM_10 domains in 265 proteins in SMART's nrdb database. Taxonomic distribution of proteins containing CBM_10 domain. This tree includes only several representative species. The complete taxonomic breakdown of all proteins with CBM_10 domain is also avaliable. Click on the protein counts, or double click on taxonomic names to display all proteins containing CBM_10 domain in the selected taxonomic class. A method is presented for the specific isolation of genes encodingcellulosome components from anaerobic fungi. The catalytic components ofthe cellulosome of anaerobic fungi typically contain, besides thecatalytic domain, mostly two copies of a 40-amino-acid cysteine-rich,noncatalytic docking domain (NCDD) interspaced by short linkers.Degenerate primers were designed to anneal to the highly conserved regionwithin the NCDDs of the monocentric fungus Piromyces sp. strain E2 and thepolycentric fungus Orpinomyces sp. strain PC-2. Through PCR using cDNAfrom Orpinomyces sp. and genomic DNA from Piromyces sp. as templates,respectively, 9 and 19 PCR products were isolated encoding novel NCDDlinker sequences. Screening of an Orpinomyces sp. cDNA library with fourof these PCR products resulted in the isolation of new genes encodingcellulosome components. An alignment of the partial NCDD sequenceinformation obtained and an alignment of database-accessible NCDDsequences, focusing on the number and position of cysteine residues,indicated the presence of three structural subfamilies within fungalNCDDs. Furthermore, evidence is presented that the NCDDs in CelC from thepolycentric fungus Orpinomyces sp. strain PC-2 specifically recognize fourproteins in a cellulosome preparation, indicating the presence of multiplescaffoldins.